“What are Ruby’s favorite cartoon characters?” her teacher asked. “It can be a nice break for the parents…” my mom said. 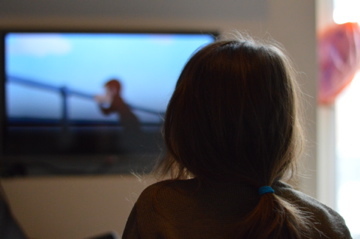 And the clincher, from an astute friend: “Does Ruby watch any tv? My boyfriend’s nephew watches Curious George. I think she would like it…there’s a lot of problem solving.” All this finally convinced me that Ruby’s relatively tv-free life wasn’t helping anyone, that a child watching tv is normal and normal where we come from is good, that perhaps I should get with the program. Curious George is a fantastic show: Yes, he problem solves. He practices counting and learns about measuring and composting and you know, Newtonian physics. He builds vending machines and turns himself into a robot. He has an awesome theme song (see the title of this post). He is narrated by William H. Macy. She quickly realized there was an unlimited amount of Curious George to be watched, beginning a painful phase where nicely asking to watch led to frantic demands for more episodes and guilt-ridden negotiations weighing the educational quality of the show and the desire for lack of trauma and screaming (which I prioritized at the end of my pregnancy and into these first weeks of the new baby’s life, and which has led to a slide in various important things and more mommy guilt) against the rule of law and the need to do things other than watch tv. Reassurances that this is normal behavior wore thin. But soon we were able to make her wait until a certain time to watch the show (like the good old days when shows were actually on tv and not accessible 24/7) and then limit it to an hour or so, with only a mini-fit of indignation at the end.”Watch monkey George?” were still the first words out of her mouth in the morning (replacing “wake up?”) and stepping off the school bus in the afternoon (replacing “eat more!”). I guess I was naive not to realize that introducing television would change the pattern of our days. There were good things about Ruby watching Curious George. She paid attention and it was clear she followed the story line. She empathized and seemed to be learning. Somehow it took me a few weeks to register George’s unique quality: as a monkey, George doesn’t talk. At first I didn’t even see it as a bad thing: I remarked to more than one person (because I have so much interesting stuff to talk about these days) that Ruby seemed particularly keen on George and maybe it had to do with the fact that while he was very expressive and smart, he wasn’t a talker — maybe she felt they were kindred spirits. But slowly I began to fret that Ruby wasn’t talking much. Not that this isn’t a familiar fret, and not that there aren’t other reasons why Ruby’s behavior might change (that baby). But she was going off into her room more, not talking while we sat together at meals, being reticent, which really isn’t like her, lately. I’ve gotten used to Ruby talking a blue streak — a very apraxic, repetitive blue streak with a very limited vocabulary. As I began to wonder if Curious George had anything to do with this, Ruby confirmed it. She started making monkey sounds. Literally. This is part of Ruby’s mystery: She’s always been impressed and entertained by sneezes, coughs, hiccups, burps, farts, clearing of throats. For years she has responded to such noises by imitating them. Quite well. It remains a struggle to get her to try to recreate a single word, but if she hears someone hock a lugie she will smirk and then reproduce that gutteral sound with glee. One day last week after we’d begun talking with dread about cutting down on George time, Andrew cocked his head towards Ruby’s room where she was busy with her dolls and said, “Did you hear that?” and I did. And it sounded just like George. So this week I introduced her to Super Why. A show about books and reading. A responsible parental choice. It’s really not as cool as Curious George. There’s a lot of repetitive filler in each episode, and those urgent kiddie-cartoon voices can irritate. But tv evidently has its usual transformative power over our curious girl, and I can’t have her turning into a monkey. Screen negotiations – very familiar!